We departed on the 6.25 am Ryanair flight to Stanstead, we were on the Stanstead Express at 8am and in Liverpool Street by 9am! 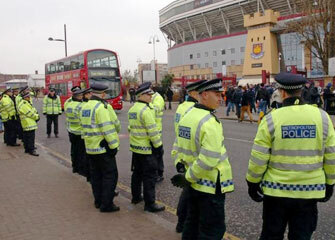 This is were things started to get messy because of the alcohol ban in the areas surrounding Upton Park. So we made our way to the Angel pub in Islington for beer and breakfast. Most of us had the 'belly buster" except the Ryans, who had sandwiches on the flight over, so opted for a small breakfast… by the way, Bobby Ryan is a 'chip off the old block' as he offered us one sandwich between 4! 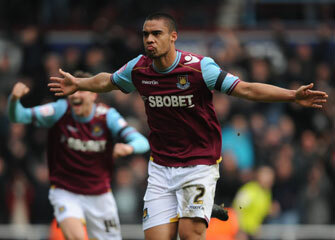 Drinking time up, we headed to Upton Park with yours truely predicting a nill all draw… my usual confident self! When the train arrived at Mile End a lot of old bill got on, one even posed for a photo with Fran. On arriving at Upton Park station we were met by hundreds of old bill (They must have heard you were coming! Ed). We were in our seats 5 minutes before KO. The match itself was poor enough, Nolen getting sent off so early did not help. I felt we were comfortable enough in the first half, so for Cole to put us one up just before hag time was a bonus and something to hold onto in the second half. Faubert headed against the crossbar at the start of the 2nd half. The Pikeys never really looked like scoring when mid-way through the half Faye did not clear the ball and Trotter, their best player, shinned one into the top corner giving Green no chance. 3 minutes later we were back in front, Reid blasting an unstoppable volley… so what if Faubert fouled the keeper in the build up! We held on to our lead to secure a great win. Good to see the players put in a great shift after the disaster at Ipswich the previous tuesday. Noble won the 'man of the match' but as pecial mention must go to Faubert, he was subbed near the end with "julian, julian, julian" echoing around the ground. Game over we headed for the tube. We were left queuing for 45 minutes cause the police marched the Pikeys up Green Street and into the underground station while we froze our nuts off waiting for them to go! Eventually we got back to Liverpool St. and into the George for a few pints before heading back to Stanstead to catch our flight. There were some Gooners on the train back, so we gave them a loud rendition of the bubbles. Had our dinner in Burger King on Dave Reids insistence! The weather was closing in, but good old Ryanair got us back to Dublin. We headed into town to meet 'the wags' to finish off the evening. Yours truely and Tommy Noctor were the last two standing as Dave and Dessie had to head for the night link!